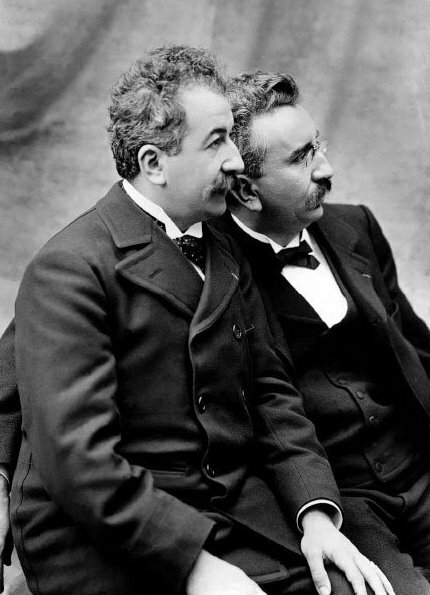 Pioneers of both moving picture and colour photography, the Lumière Brothers – Auguste (1862-1954) and Louis (1864-1948). Long before the convenience of high speed Kodachrome colour film, and even before hand-tinting black-and-white images became a thing, the Lumière Brothers (of motion picture fame) created an ingenious colour photography process called Autochrome. Based on glass plates coated in specially dyed potato starch grains behind a conventional silver emulsion, Autochrome Lumière was patented in 1903 and remained the pre-eminent colour process until Kodachrome arrived in the 1930s. It was, however, slow and rather cumbersome, which is why monochromatic images dominate most archives. The glaring exception to that dominance is, of course, the Albert Kahn Collection, held by the Musée Albert-Kahn in the Boulogne-Billancourt district of Paris, France. Kahn himself (March 3rd, 1860 – November 14th, 1940) was a successful banker and enthusiastic photographer* who conceived a monumental Autochrome collection after a business trip to Japan in 1909. Named Les Archives de la Planète (The Archives of the Planet) he set out to create a photographic collection showing life on every continent on Earth. With Kahn’s backing, a number of photographers carried their heavy equipment around the world for 22 years, accumulating 72,000 colour photos and over metres of film covering every aspect of everyday life. Happily for us, that included a number of aviation subjects. 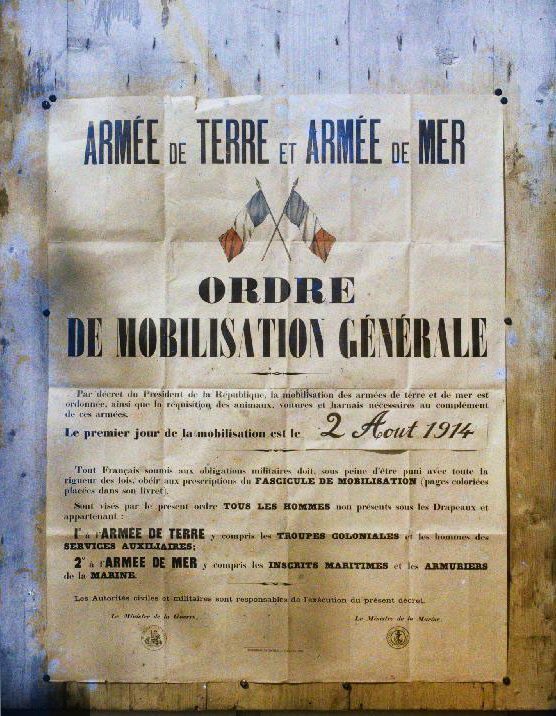 Studies of life in France itself began at the end of July 1914, just days before the General Mobilisation that opened World War One – giving Les Archives a critical role in the conflict’s visual record. Kahn, unfortunately, lost his wealth in the global crash of 1929. 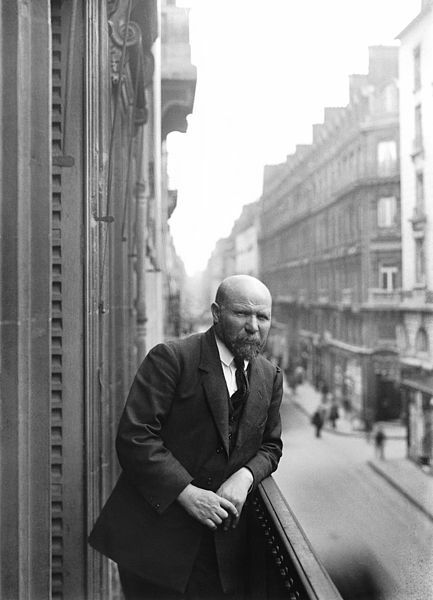 But his far-flung photography project took until 1931 to finally wind down. Having fled the Prussian invasion of France in 1870 as a 10 year old boy, Albert Kahn died at his Paris home 70 years later, six months into a new German occupation of France. Heaven knows what he made of that. His extraordinary colour collection is now curated and exhibited by the dedicated Albert Kahn Museum, which adjoins his beautiful Jardins du Monde (Gardens of the World). The lion’s share of the photographic archive – over 60,000 images – is searchable and viewable online, and the files are freely available for personal and educational use. Knowing a little French is handy, but if you scroll down to the map and search feature it’s all fairly international. 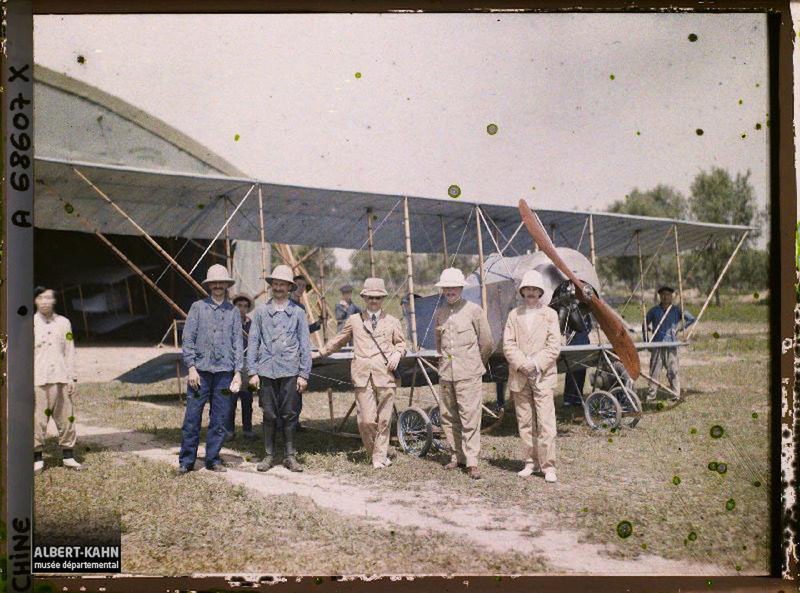 René and Gaston Caudron (in blue) introduce Chinese officials to their Caudron Type F, during a French mission to Beijing between May 25th and June 27th, 1913. The Chinese government bought 12 of the single seaters. 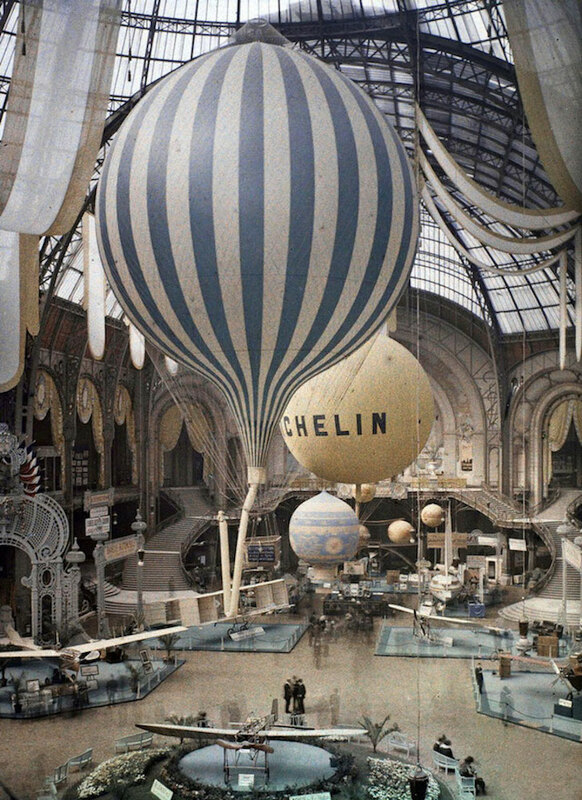 December 1913 was, once again, time for the annual Salon de l’Aéronautique in Paris. 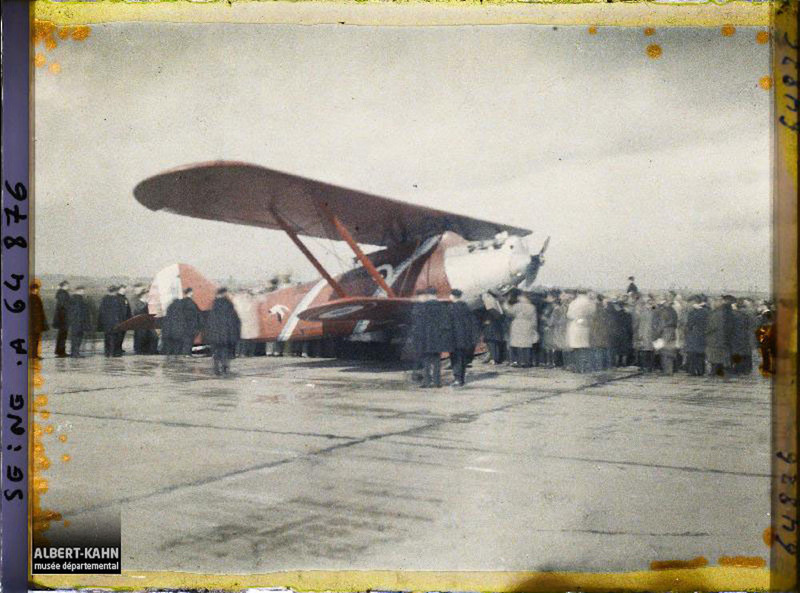 The annual Salon had grown out of the Motor Salon since 1909, and rapidly became the definitive showcase for aircraft manufacturers and all their latest ideas. It would evolve into the biennial Paris Air Show, now the world’s largest. In their coverage of the 1913 Salon, Flight magazine bemoaned the scarcity of exhibitors and the lack of innovative ideas compared to previous years – but the majors were all there, including Bleriot, Caudron, Bristol, Nieuport, and more; plus engine, balloon and hydroplane makers. The museum’s data doesn’t say, but this looks to me like a Maurice-Farman MF.11 Shorthorn with extra short skids. 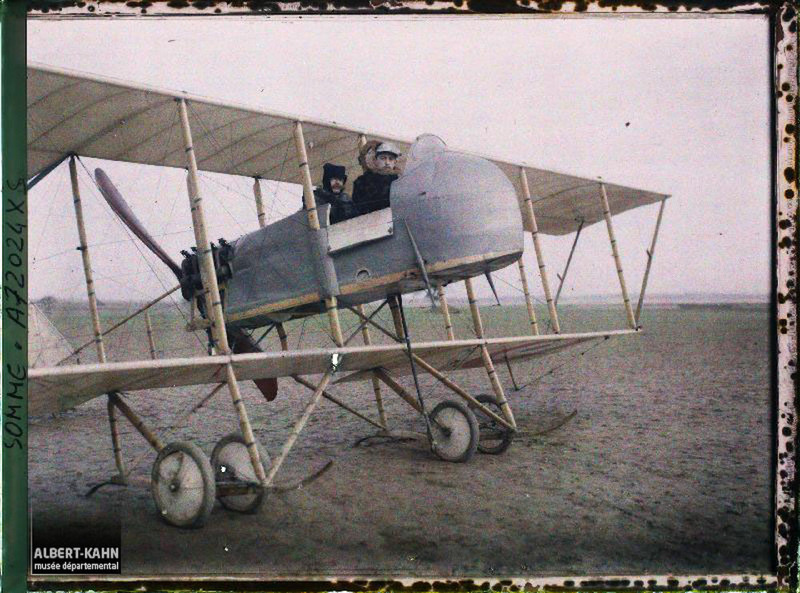 It is certainly a French Aéronautique Militaire craft, photographed near Amiens in 1916, making it most likely a training or communications plane, which would also explain the absence of guns. Another Shorthorn (I think!) at the same field near Amiens in 1916 – but this one sports a rather lethal-looking arrangement of machine guns in a specially built turret. Note the crossed bombs on the ground too – making me think this craft was possibly used for ground attack, and that the turret is probably armoured. A French Nieuport 23 C.1 squadron at Soissons on the Aisne in Northeastern France, on May 27th 1917. The 23 C.1 was a variation on the immensely successful Nieuport 17, featuring a new interruptor gear that meant the Vickers gun had to be mounted left of the centreline. These photos were taken shortly after the disastrous 2nd Battle of the Aisne in which some 120,000 French casualties over 30 days triggered a soldiers’ mutiny. 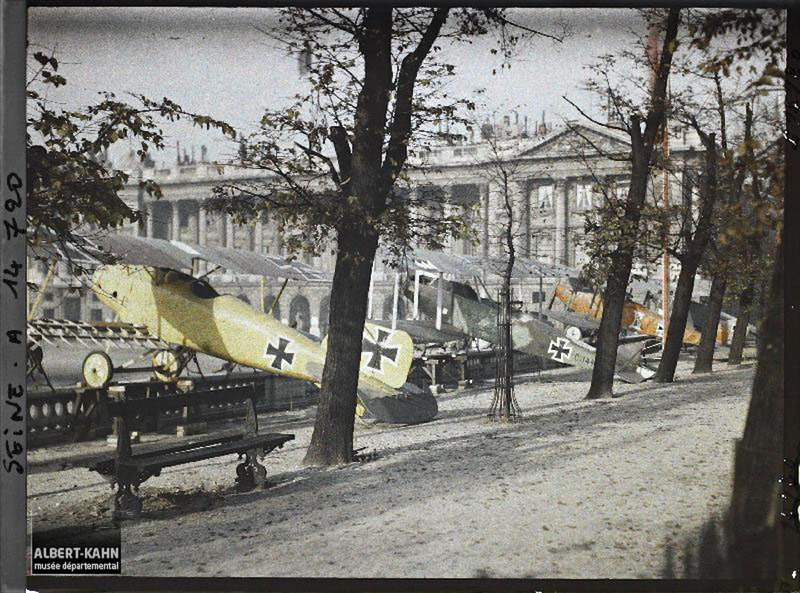 This fascinating set of images shows captured German fighters, which were displayed in the Jardin des Tuileries, Paris (along with guns, vehicles and even an observation balloon) for the long-suffering French public to see. Interestingly, these photos weren’t taken after the November 1918 Armistice as you might have thought; they date from October 1918. In other words these frontline Fokker and Albatros types were all taken during the fighting – albeit the final German retreat. 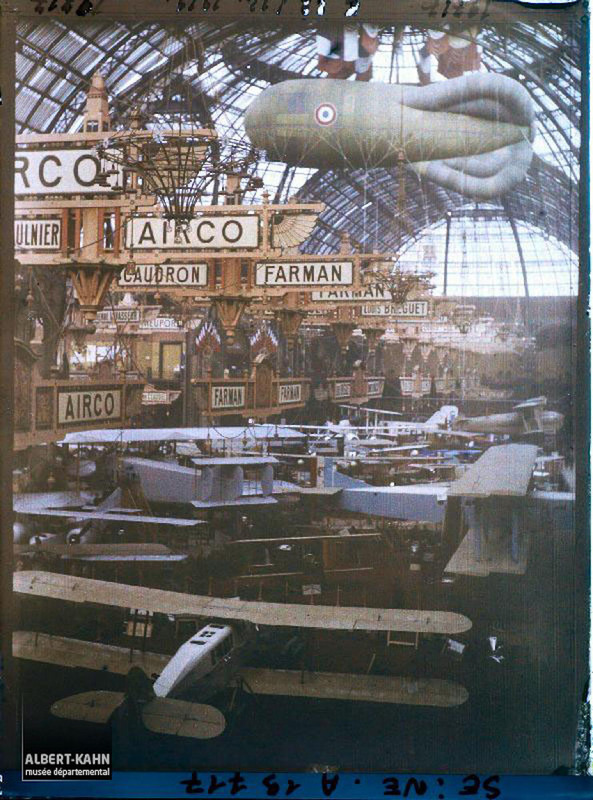 In December 1919, the French reinstated their Salon de l’Aéronautique in the Grand Palais, Paris. This sixth Salon picked up where the five pre-war Salons (1909 through 1913) had left off, and would continue biennially until the Second World War. Some great and long-forgotten names of aviation were represented at the 1919 exhibition and, just one year on from the Great War, there is an amazingly clear and strong vision of aviation’s commercial potential. 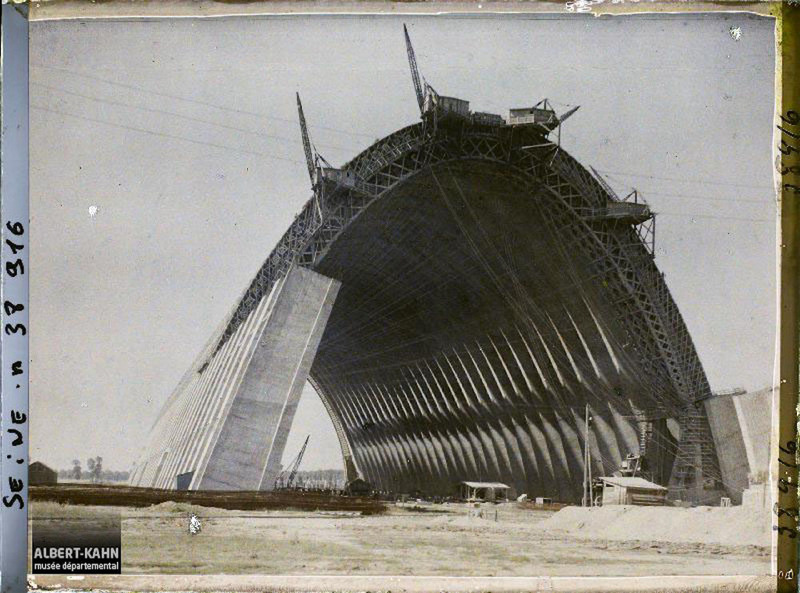 Designed by the great engineer Eugene Freyssinet using his revolutionary concrete shell construction method – corrugated formers providing a stiff, light mould for the poured concrete – the hangars were each 75 metres wide inside, and 144 metres long. Their elegant parabolic arch became the de facto shape for large airship hangars around the world. The biplane looks like our old friend the Nieuport 17 – or one of its many derivatives – sold into civilian hands… Any input would be appreciated. 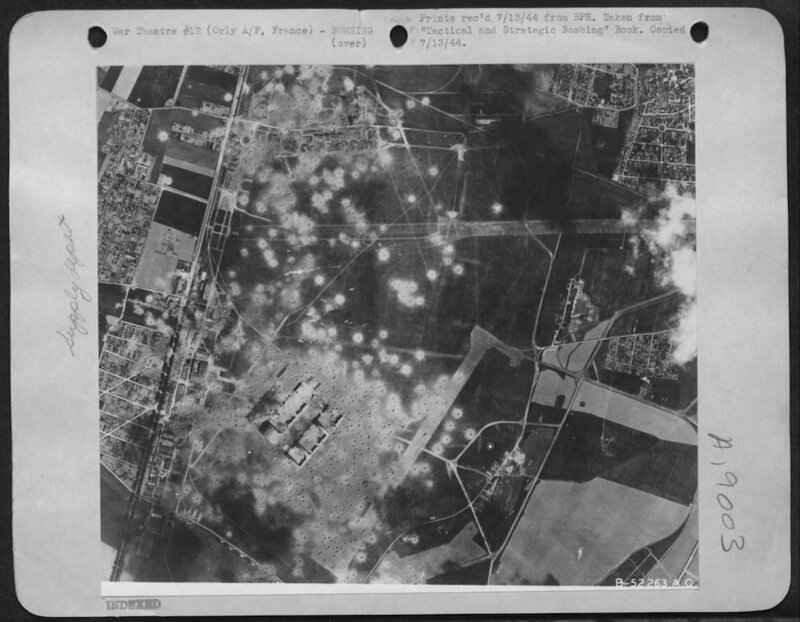 The destruction at Orly airport after the 306th BG, US 8th Air Force, visited with a force of 90 B-17s on May 20th, 1944 (Mission #359). The remains of Freyssinet’s enormous concrete hangars are plainly visible in the lower left quadrant. On September 2nd, 1930, French aviators Dieudonné Costes (1892 – 1973) and Maurice Bellonte (1896 – 1983) smashed a significant aviation barrier by crossing the Atlantic against the prevailing winds – flying westwards from Paris to New York. The 6,000 km flight took over 37 hours in a specially modified Breguet XIX light bomber dubbed Point d’interrogation – yep, ‘the Question Mark’ – and had only been accomplished by airships until then. 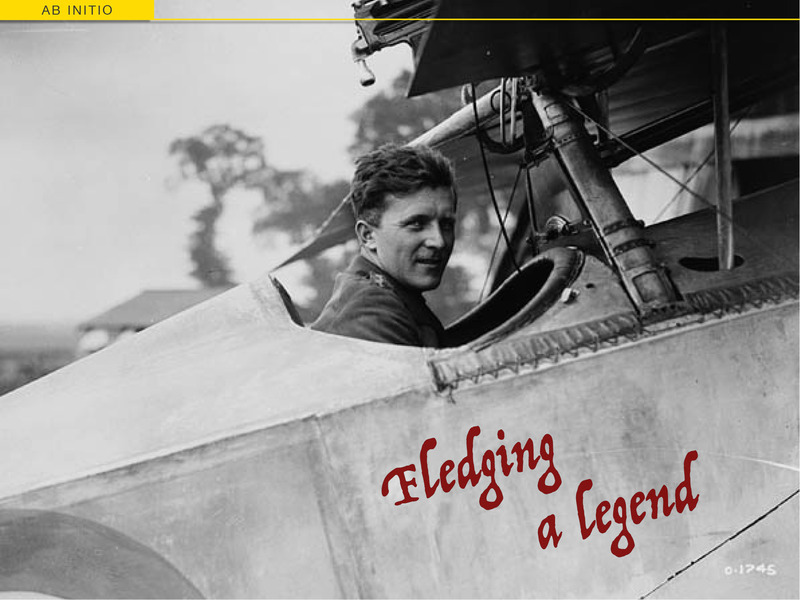 Costes, who was also an 8-victory WW1 ace, had already been first to cross the South Atlantic non-stop, flying from Senegal to Brazil in another Br.19 in October 1927. 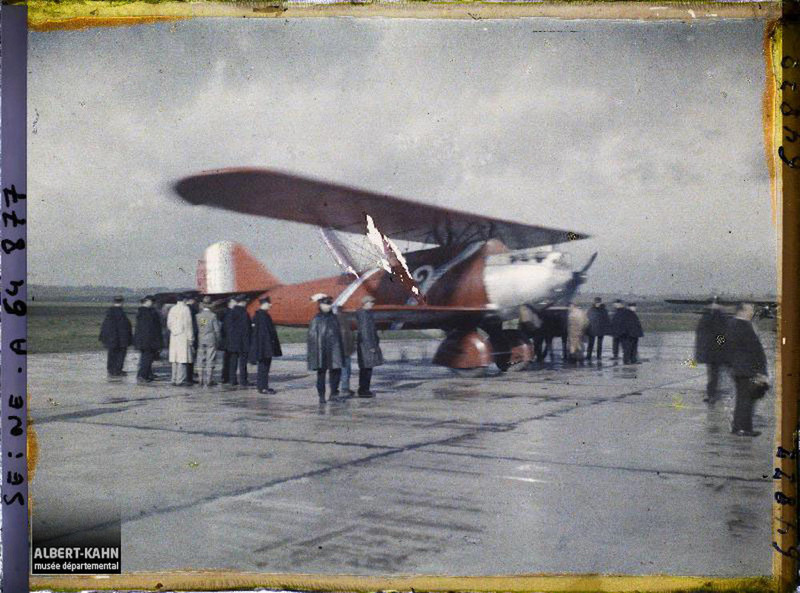 After the New York flight, Costes and Bellonte returned to France, arriving at Le Bourget Airport, Paris, on October 25th when these Autochrome images were made. Bloody Brilliant David – very interesting. Thanks. It’s amazing what’s out there isn’t it? Wow. This is without a doubt one of the most amazing aviation- or history-related things I’ve seen on the internet. I had no idea color photography was achieved so early on! It’s incredible how color changes the pictures and brings them to life. It’s especially meaningful since aircraft of that era were far more elegant and colorful than the drab (although admittedly more effective) camouflage schemes of later years. A tremendous find! Thanks for posting. That’s so true. Looking at those captured German fighters, the Luftstreitkräfte pilots certainly weren’t buying cans of ‘low visibility gray’. But there are plenty of reds, blues and silvers in the other shots too. It’s nice to be reminded that life has always been full-colour. Encore! Amazing and what a great read. Thanks. I’ve just discovered a WWII press image collection of 4600-odd images on Flickr (not just aviation), but this is terrific: Real WWI colour (well – to a point) not imaginative modern colourisation. More hours in front of the computer! I love how casual some of these pictures are, it makes people back then seem more alive and not so stoic. We are so used to seeing black-and-white images that we often forget “the war was fought in color” and not black-and-white. I know what you mean. It’s one thing to read about the German fighter pilots painting their planes gaudy colours (hence the term ‘flying circus’), and even to see faithfully painted replicas flying today. But only seeing those bright yellow and orange Albatroses in a period photo brings the reality home. Your point about the people is interesting too. Colour brings them to life – and not just in a sense of them being more animated. I think it somehow proves they were people just like us, with lives and cares and families… So when we mention 120,000 French casualties in one month, that really was 120,000 people. Totally absorbing. Thank you very much. The colour brings the weather alive too and I can only imagine what some pilots had to fly through. Combat was one thing, but weather another. Hey, nice observation. While WW1 pilots took more risks that replica flyers today, flying in cloud for example was viewed as strange and dangerous. A lot of the first-hand accounts mention each day’s weather almost obsessively; and why wouldn’t they when a rainy day could save your life?! Great photos. Thanks for sharing and informing many, including me, of the Lumière Brothers’ colour photography process, Autochrome. In the paragraph about the Salon de l’Aéronautique, you mention that it continued biannually until WW II. Two things here. Biannual = twice per year. These events were (and still are) held biennially i.e. every second year. They restarted in 1946, next 1949, then biennially since then. In 1961 “et de l’Espace” was added to the name. The 52nd Salon International de l’Aéronautique et de l’Espace was held in June 2017! Dammit! That just goes to show you can never be too careful!! I even double-checked my biennial/bi-annual definitions when I was writing this, then went and wrote ‘bi-annual’ anyway. Thanks for bringing it to my attention. I’ve corrected the mistake (so everyone else will wonder what we’re talking about).